Grizzled Ugly Aging Seduction Master Announces His Greatest Girl-Getting Course Ever-Plus Promises Your Deep Personal Transformation Just By Watching It! Every once in a while, the unexpected slaps me hard in my filthy little mind. But I always bounce back with something newer, unexpected, and bottom line better for you guys. 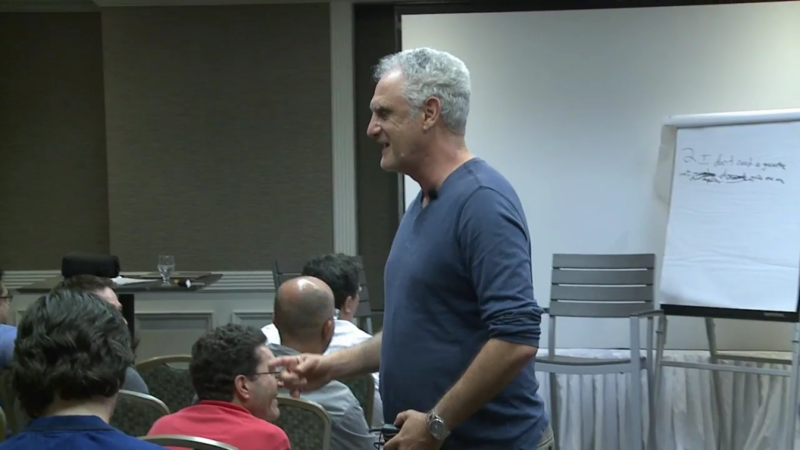 Just a few weeks ago I did a Speed Seduction® New Code seminar in Miami, THINKING it would mostly be like my July 2015 LA event, just with a different audience. On the plane from San Diego to Miami, I felt the itch in my throat and the burning pain in my ear that told a full blown cold was seizing my system. Anyhow, by the time I took the stage two days later…..
…..My Body Had a Cold, but My Mind Was On FIRE! ……a new form of trance-work/change creation and went nuts pulling student after student on stage, displaying a virtual wizardry that left sparks flying off the guard rail of their realities. I’m telling you: not only did these students I worked with experience massive change with more ease (and in record time) than any other event I’ve done in the past 28 years of teaching, the students in the audience were virtually ranting to each other and me about……. ……how merely by watching, they found the changes flowing through them. because it not only deals with the revolutionary Speed Seduction® system, but my personal change method. Let’s deal with the Speed Seduction® part first. Four of My Newest “Balls To The Wall” Openers (with variations you can play with) that will have you make such an impact, that you’ll be half way to hitting a home run before you utter another word! My three BRAND-NEW language patterns – called “Instantly Recognize”, “Flicking The Bean”, and “You Know Debbie” – including the contexts, themes, and frames that make them especially effective! The Parable of the Beach Ball which places all of your girl-getting skills into a brand-new perspective and bounces you to the land of Moist Pink Abundance! 10 Key Elements of the New Code that you can use like a “checklist” as you fine-tune and claim your results with your women who you truly desire and want to be with! The Truth About “Attraction” – which I am now calling the “Sipowicz Factor” – that permanently removes any concerns you may be too old, too ugly, too out of style, or too out of touch to succeed with women! Batting Out of Your League (or “Out-kicking Your Coverage”) – with special emphasis on the personal beliefs that help you score with women you, up until now, thought out of reach! How To Attract Younger Women (as in, 20 or 30 years younger) – make no mistake: younger women ARE harder to handle and this is NOT a game for amateurs. Get my guidance and get yourself going!